Four chefs from local restaurants prepared meals in a friendly competition to create “the ultimate summer meal” at Othello Park on Wednesday. 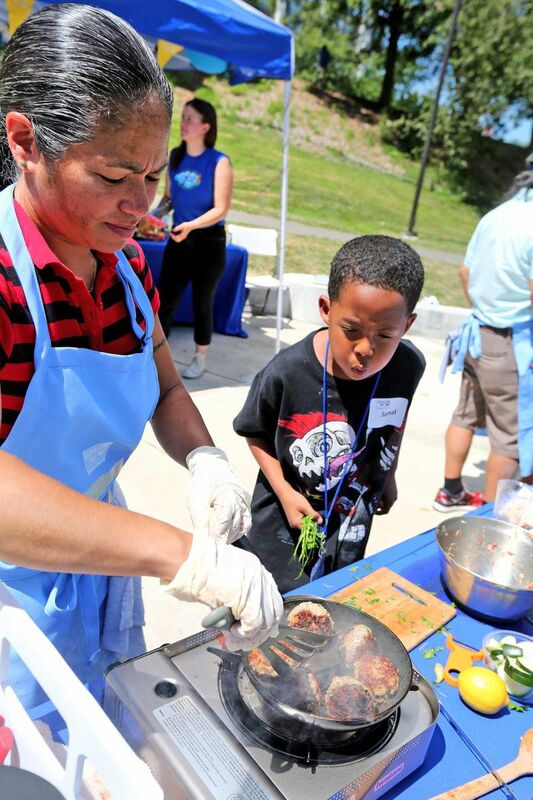 Celebrity Chef Maria Hines was one of four chefs from local restaurants preparing meals in a friendly competition to create “the ultimate summer meal” at Othello Park on Wednesday. The event is one of several hosted by , a collaboration among No Kid Hungry, AmeriCorps VISTA, Seattle Children’s hospital and the Seattle Seahawks to combat hunger among low-income kids and teens. The summer meals program offers free breakfasts and lunches at various parks and community centers Monday through Friday for 10 weeks throughout the summer. One in 5 students in Washington struggles with hunger. Free and reduced-price school meals are designed to alleviate hunger among struggling families, but when school is out, many kids don’t have access to healthful meals. United Way of King County and Summer Food Invasion fill the gap for low-income families during the summer break.